(CNN) -- The most talked-about man in American politics isn't in America or in politics. Gen. Stanley McChrystal reportedly wants as many as 40,000 more U.S. troops in Afghanistan. He's a slim and ascetic four-star general who says Afghanistan may need up to 40,000 more U.S. troops, and he was supposed to keep it a secret. General Stanley McChrystal commands the 100,000 U.S. and international forces there. His officially confidential assessment of the war was leaked to the Washington Post. He sat for journalists' interviews and addressed a widely publicized seminar in London. His message was plain: "The situation is serious," he said. "We need to reverse the current trends." 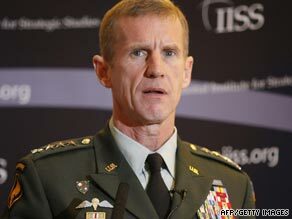 Do you think General McChrystal's views on the war should have been publicized? But by the traditions of the U.S. military, his conclusions should have been delivered quietly up the chain of command. Instead, they sparked a noisy national debate. His superiors aren't happy. "It is imperative that all of us taking part in these deliberations, civilians and military alike provide our best advice to the president candidly but privately," said Defense Secretary Robert Gates. Harsh Afghan outposts raise serious challenges for U.S. In fact, McChrystal has set off an unusually public discussion among the president's closest advisors. As CNN Pentagon Correspondent Barbara Starr noted: "They're all talking about keeping their advice private; they're all out there talking." McChrystal has been on the job for only four months and until now, may have been best known for a legendary devotion to duty that leaves time only for vigorous pre-dawn exercise and a single meal a day. But at age 55, he's had a long and storied military career going back more than three decades. McChrystal commanded the unit that captured Saddam Hussein and killed Abu Musab al Zarqawi, the leader of al Qaeda in Iraq. But he was also criticized for his role in an alleged cover-up surrounding the friendly fire death of former American football star Pat Tillman, who gave up a lucrative sports career to serve as a soldier in Afghanistan. Now McChrystal has put the president and the country on notice that he needs a lot more men and support to win in Afghanistan. Just about every conversation about the war has been changed by that summons from its commander.